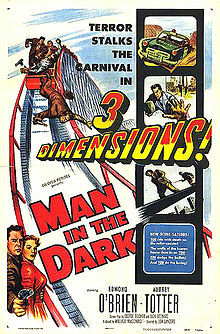 60 years ago today, Columbia Pictures premiered the first 3-D movie produced and released by a major studio, Man in the Dark, at the Globe Theater in New York City. The unexpected success of the previous year’s Bwana Devil in 3-D sparked a stampede from the major studios to release their own 3-D films. Columbia Pictures rushed a current project into production and completed it in 11 days.